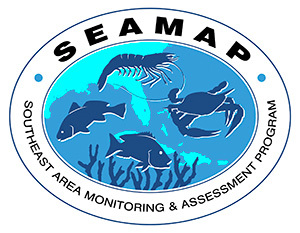 Below is the sixth preliminary data summary for the 2007 SEAMAP Summer Shrimp/Groundfish Survey in the northern Gulf of Mexico . This week's summary includes sampling July 6 through July 8 by the Mississippi vessel Tommy Munro. Catch data were taken with a 40-ft trawl. The catch data from west of the Mississippi River indicated that the highest catch rate of brown shrimp was 15.9 lb/hr in 3 fm at 29° 01' N. lat. and 90° 56' W. long. The highest catch rate for white shrimp was 15.3 lb/hr in 3 fm at 29° 01' N. lat. and 90° 56' W. long. No pink shrimp were caught west of the Mississippi River during this sampling period. The maximum total catch rate excluding the three shrimp species was 438 lb/hr in 4 fm at 29° 11' N. lat. and 92° 12' W. long. The NMFS vessel Oregon II has experienced mechanical problems and will not be able to finish approximately 75 stations off Louisiana until July 26. Therefore this will be the last report for 2007. An end of survey report will be produced and distributed after the Oregon II has finished.